The trends in population growth and aging in the countries included in this report reflect the trends for the regions in which they are located. In all major regions of the world, the population of seniors is growing faster than the populations of other age groups and the median age is on the rise. But the aging process is expected to vary across regions, and there should be a significant shift in the distribution of the world population. The share of Africa in the global population is expected to increase at the expense of Asia and Europe, especially among children and working-age people. The most populous region in the world, by far, is Asia & Oceania. Home to 4.2 billion people, it accounted for 61% of the global population in 2010. The populations of Africa and the Americas (North and South America) were roughly identical in 2010, 1 billion and 0.9 billion, respectively. Europe was not too far behind with 0.7 billion residents accounting for 11% of the global population. There are large variations in how regional populations are expected to change in the future. 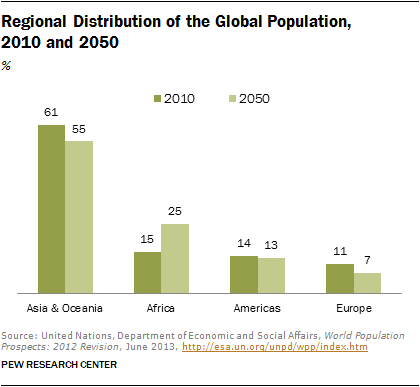 The global population is projected to increase by 38% from 2010 to 2050. 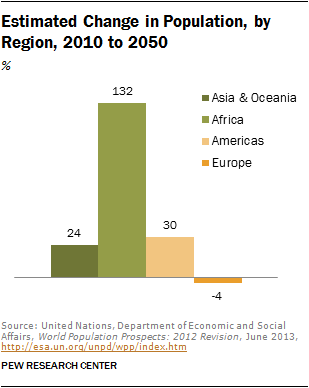 However, the population of Europe is expected to decline 4% from 2010 to 2050. At the other extreme is Africa, whose population is projected to more than double, increasing 132% from 2010 to 2050. 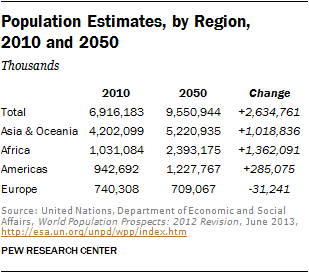 Population growth in the Americas and Asia & Oceania is expected to be moderate. The population in the Americas should increase by 30% from 2010 to 2050, just a bit higher than the 28% growth expected in the U.S. The population in Asia & Oceania is expected to increase by 24%, less than in the U.S.
Africa, it is anticipated, will also have the distinction of adding the greatest number of people from 2010 to 2050. The African population is expected to increase by 1.4 billion, more than the increase of 1 billion projected for Asia & Oceania and nearly five times the increase of 0.3 billion expected for the Americas. The rapid growth in Africa’s population should increase the share of the world’s population that lives there from 15% in 2010 to 25% in 2050. The share of the global population that lives in Asia & Oceania is projected to decrease from 61% to 55%, and the share that lives in Europe should decrease from 11% to 7%. The stature of the Americas, as measured by relative population, remains more or less unchanged through 2050. Aging has a firm foothold in all regions of the world. 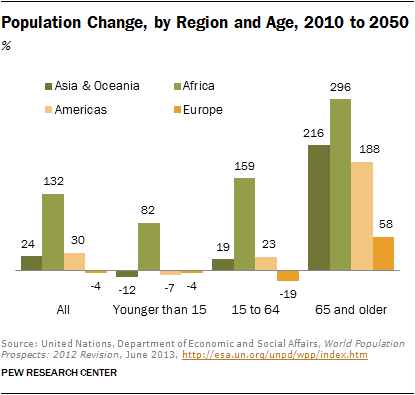 Only the population of seniors, ages 65 and older, is projected to increase in all regions from 2010 to 2050. Once again, growth is expected to be the fastest in Africa (296%). But it should also be rapid in Asia & Oceania (216%) and the Americas (188%). The projected increase in the population of seniors in Europe is a comparatively modest 58%. However, that growth builds on what is already a large base of older residents. The population of children younger than 15 is expected to increase only in Africa, by 82% from 2010 to 2050. In sharp contrast, the population of young children is projected to fall by 12% in Asia & Oceania, 7% in the Americas, and 4% in Europe. 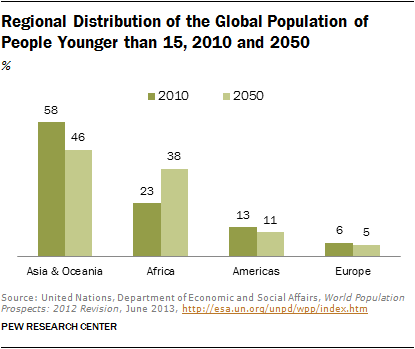 Africa is also the only major region where notable growth is projected for the primary working-age population. From 2010 to 2050, the population ages 15 to 64 should increase by 159% in Africa, 19% in Asia & Oceania, and 23% in the Americas. In Europe, this population may decrease by 19%. Overall, the projected changes in population are most sharply tilted toward the oldest age group in Asia & Oceania. In part, this is driven by the rapid aging of China. 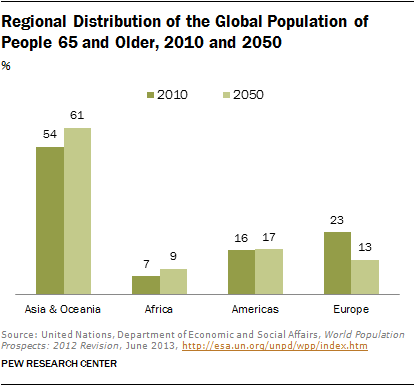 Thus, the share of the global population of people ages 65 and older living in Asia should rise from 54% in 2010 to 61% in 2050. Europe, where population is generally on the decline, is likely to find that its share of the global population of seniors has also declined, from 23% in 2010 to 13% in 2050. At the other end of the age spectrum, the share of young children living in Africa is expected to rise sharply, from 23% in 2010 to 38% in 2050. The youth share in Asia & Oceania is projected to decline from 58% to 46%. The global labor force will also shift in the direction of Africa. The share of prime working-age people (ages 15 to 64) living in Africa is expected to increase from 13% to 25%. Asia & Oceania will likely experience erosion in its share of the working-age population, from 63% in 2010 to 56% in 2050. Europe’s population is the oldest in the world, and the region should retain that distinction in 2050. In 2010, Europe was the only region with a median age of 40. It is projected to age up to 46 in 2050. Africa, with a median age of 19, is currently half as young as Europe. Africa’s median is likely to rise to 25 by 2050, but even then it will be younger than any other region is today. 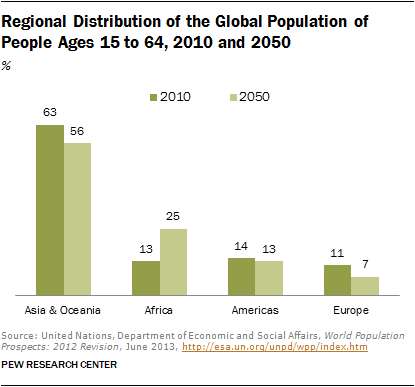 Latin America and Asia are expected to experience double-digit increases in their median ages. 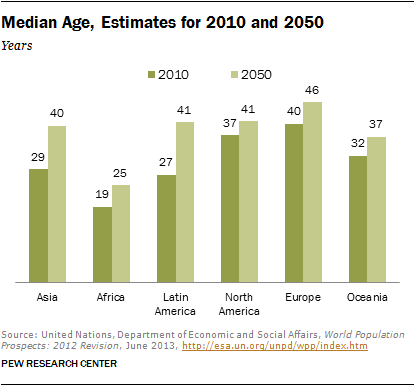 The median age in Latin America should increase from 27 in 2010 to 41 in 2050, and the median age in Asia should rise from 29 in 2010 to 40 in 2050. Thus, these two regions are likely to catch up with North America by 2050 and also close much of the age gap with Europe.32 North America may age up the least, adding only four years between 2010 and 2050. 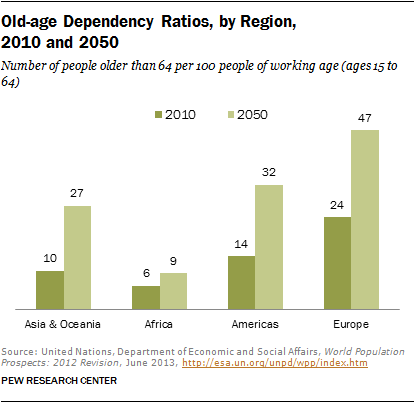 Because the population of seniors is projected to grow faster than the working-age population in all regions, old-age dependency ratios are also expected to rise all over the world. In Asia, the old-age dependency ratio is expected to nearly triple, from 10 seniors per 100 working-age people in 2010 to 27 in 2050. The ratio should more than double in the Americas, rising from 14 to 32, and it may nearly double in Europe, from 24 to 47. The current old-age dependency ratio in Africa is only 6, and it is expected to remain relatively low in the future, reaching 9 in 2050. As old-age dependency ratios increase, countervailing decreases in the child dependency ratios are expected in all regions except Europe. The sharpest decline may be in Africa, where the number of children younger than 15 per 100 working-age people is expected to decrease from 74 in 2010 to 52 in 2050. The ratio falls from 38 to 28 in Asia & Oceania and from 38 to 29 in the Americas. In Europe, where the size of the working-age population is shrinking, the child dependency ratio is projected to increase from 23 in 2010 to 27 in 2050. In Asia & Oceania and the Americas, the expected reductions in child dependency are not sufficiently large to make up for the growing numbers of seniors. The result is an expected increase in the total number of dependents per 100 working-age people—from 48 in 2010 to 55 in 2050 in Asia & Oceania and from 52 to 61 over the same period in the Americas. Europe, where the only growing population is seniors, is projected to experience the sharpest increase in the total dependency ratio, from 47 to 73. Thus, for every 100 people of working age, Europe may have nearly three-quarters the number of dependents in 2050. 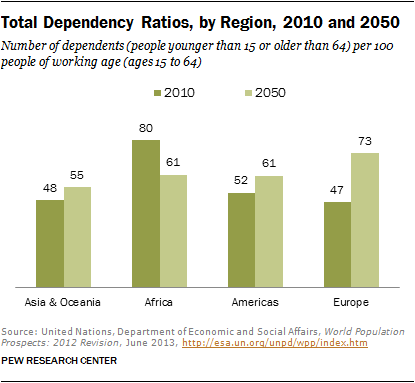 Africa is the only region where dependency ratios are projected to decline. With the prime working-age population growing rapidly, the total dependency ratio in Africa is expected to decrease from 80 in 2010 to 61 in 2050. 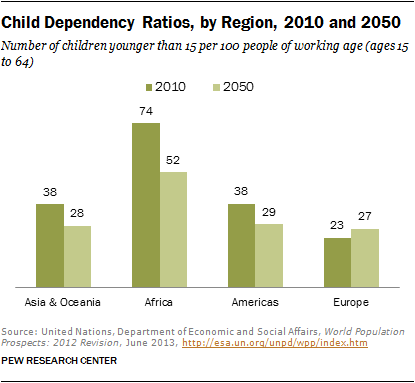 Thus, by 2050, there should be almost 20 fewer dependents per 100 working-age people in Africa. That is potentially a very favorable demographic outcome that could spur economic growth on the continent.